Night & Day. Location: St Georges Dock Ventilation Station Liverpool, Merseyside, England. 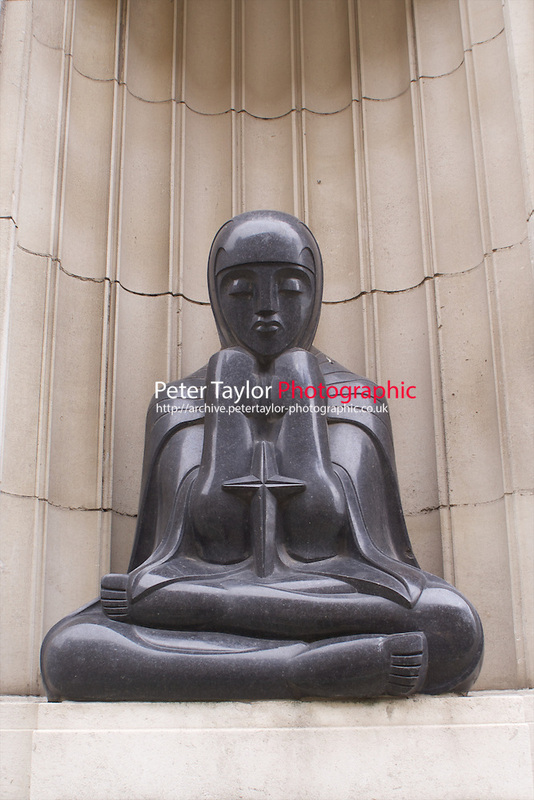 Designer: Herbert J. Rowse 1925-1934, Rebuilt 1951-1952 Sculptor: Edmund C Thompson The statues of Day and Night can be found near the base of the George’s Dock Ventilation and Central Station of the Mersey Road Tunnel. This ventilation tower is one of six in total for the Queens Way tunnel. The tower was designed by Sir Basil Mott (Main architect) and John A. Brodie (Liverpool City Engineer) with Herbert J. Rowse as architect. The tower which forms part of the Liverpool skyline and part of the world heritage site was badly damaged during the war, and had to be largely rebuilt by Rowse in 1951-52. The two statues are made of Basalt and were sculpted by Edmund C Thompson.